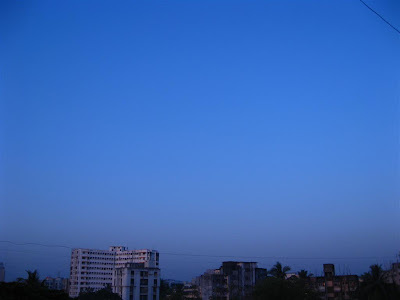 The Mumbai sky as seen this morning at 0700hrs. 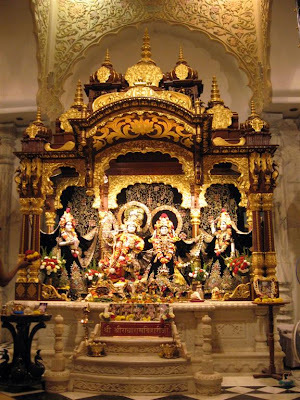 Lord Krishna and Radha - the idols inside the ISKCON temple in Juhu, Mumbai. Am on a holiday. 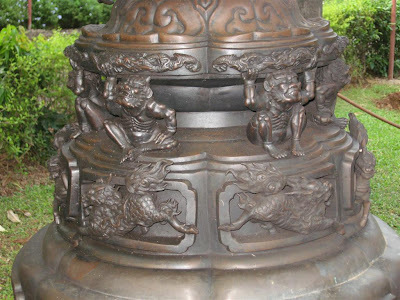 This is auto posted hence please excuse me for not being able to visit your posts. ABC Wednesday - O for on the roof! 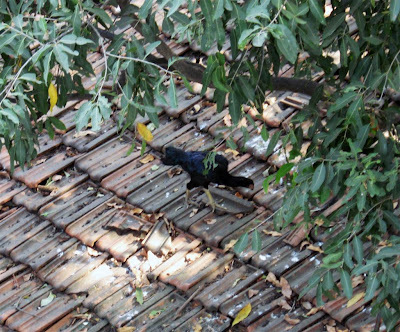 On the rooftop for breakfast! 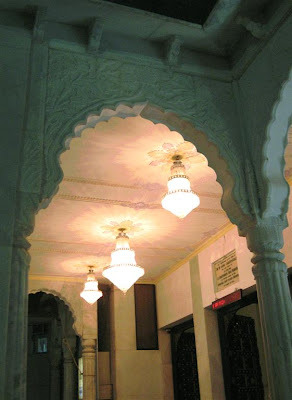 Chandeliers at the entrance to the ISKCON temple in Juhu, Mumbai. I will not be around for a few days so please excuse me for not visiting your blogs which I shall miss a lot. But will make up for it once am back. Am also attempting to post 'auto' for the next 3 days. 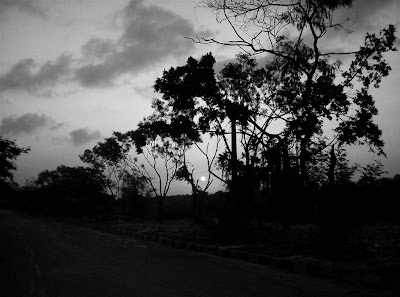 A sunrise in the Bandra Kurla Complex in Mumbai. 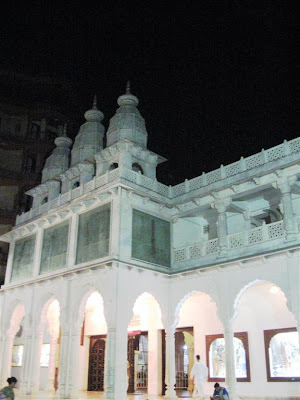 The International Society for Krishna Conciousness (ISKCON) Temple from anoher perspective. 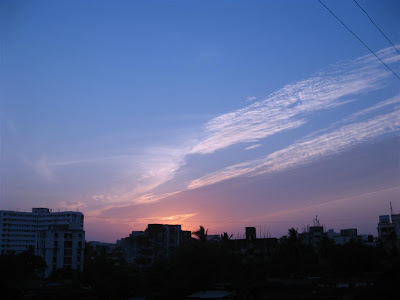 The Mumbai sky on 21oct08 at 1832hrs. 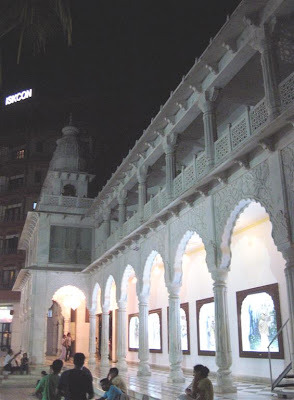 The International Society for Krishna Consciousness (ISKCON) was founded by His Divine Grace A.C. Bhaktivedanta Swami Prabhupada in 1966. It belongs to the Gaudiya Vaisnava tradition, a devotional tradition based on the teachings of Bhagavad-gita and Srimad-Bhagavatam. 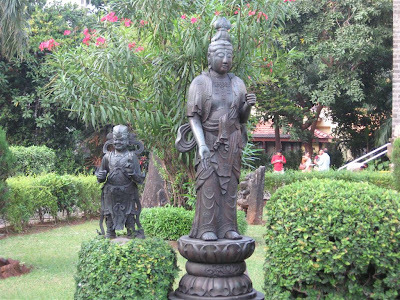 Hare Krishna Land (ISKCON Juhu) is set upon four acres of prime land near Juhu beach. 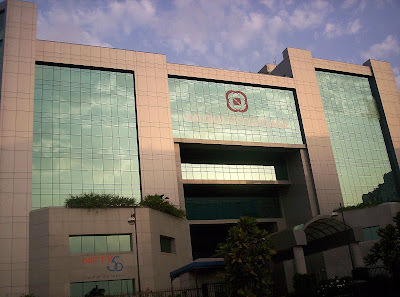 The National Stock Exchange building in the Bandra Kurla Complex - the upcoming Business district of Mumbai. 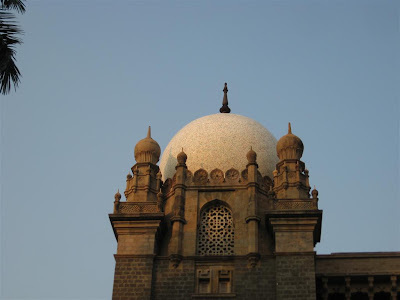 The dome at one of the corners of the Museum (Chhatrapati Shivaji Vastu Sanghralaya) in Mumbai. 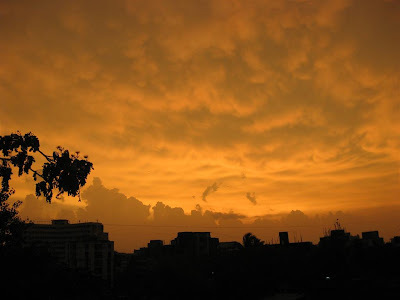 The Mumbai sky at 1802hrs on 16thOct08. 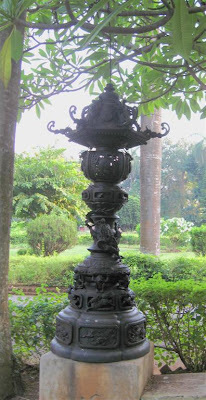 A close up of the artefact I had posted earlier which is displayed in the lawns of the Museum in Mumbai. ABC Wednesday - M for Museum! Barely a stone's throw from the Gateway of India is the CHHATRAPATI SHIVAJI MAHARAJ VASTU SANGRAHALAYA (Formerly known as: THE PRINCE OF WALES MUSEUM OF WESTERN INDIA), a magnificent structure, built in a confluence of Gothic and Moorish styles, and crowned by a sparkling white dome. 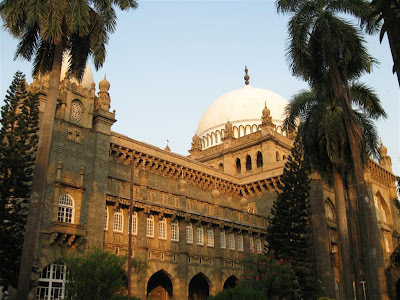 In the early years of the twentieth century, some prominent citizens of Bombay decided to set up a Museum with the help of the government to commemorate the visit of the Prince of Wales. 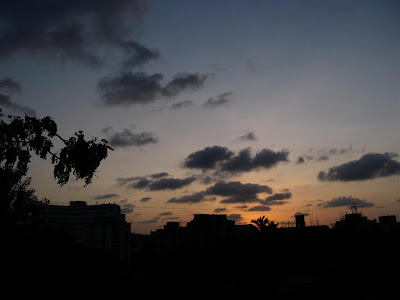 On March 1, 1907, the then government of Bombay handed over to the museum committee a spot of land known as the "Crescent Site", situated at the southern end of the present Mahatma Gandhi Road. After an open competition for the design, George Wittet was commissioned to design the Museum building in 1909. The construction work was concluded in 1914, but the structure was converted to a military hospital for the period of World War I. The full-fledged museum was inaugurated by Lady Lloyd in 1923. Its façade is made of yellow and blue stones, mined from the Bombay region. It has an assortment of details from different Indian styles like small spherical cupolas on towers, saracenic arches with Muslim jalis as fillers, semi-open verandahs and jharokhas (windows) of Rajputs. Its dome has been designed deliberately, so as to append variety in the skyline and make a landmark at ground level. formerly known as: THE PRINCE OF WALES MUSEUM in Mumbai. 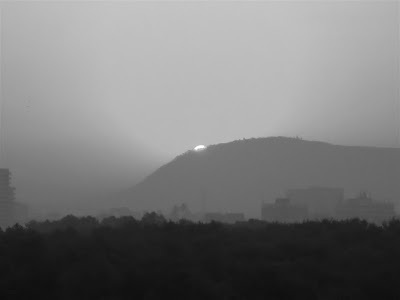 Monochromatic sunrise at the Bandra Kurla Complex. 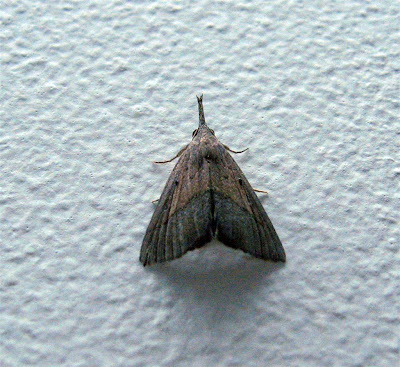 Heres another moth. 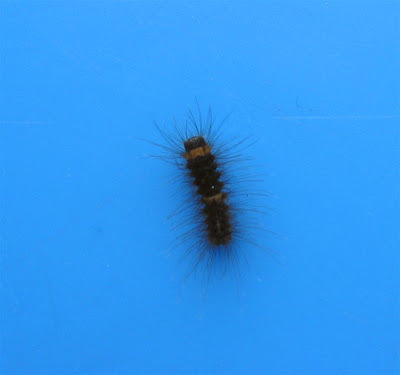 An amazing looking critter! I do not know what tree this is but love the multi coloured leaves it displays. 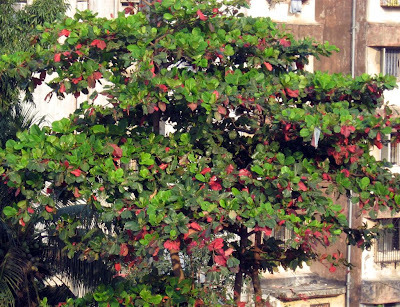 There are quite a few of these trees in Mumbai. I will be happy if any of you could identify this tree for me please. 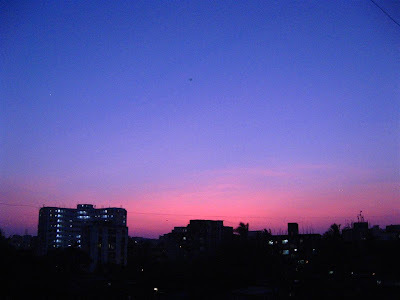 Twilight in Mumbai. Photograph not tampered with. As is where is on 04oct08 at 1829hrs. 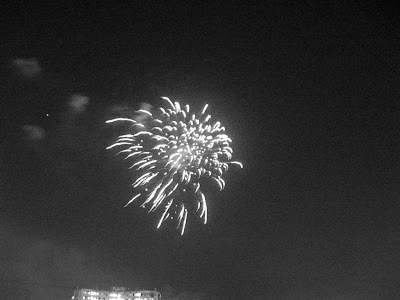 Thanks to Babooshka, had the courage to use manual settings. 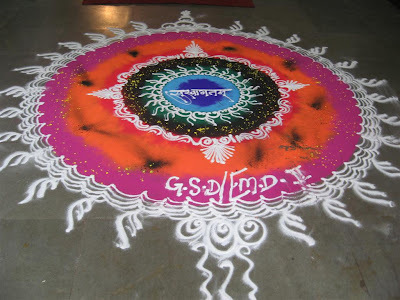 Rangoli is one of the most popular art forms in India. It is a form of sandpainting decoration that uses finely ground white powder and colours, and is used commonly outside homes in India. Rangoli can be wall art as well as floor art. The term rangoli is derived from words rang (colour) and aavalli ('coloured creepers' or 'row of colours'). The picture above is a Rangoli made at the entrances to one of the offices in Mumbai where the Puja of Goddess Durga was being held. The motifs in traditional Rangoli are usually taken from Nature - peacocks, swans, mango, flowers, creepers, etc. 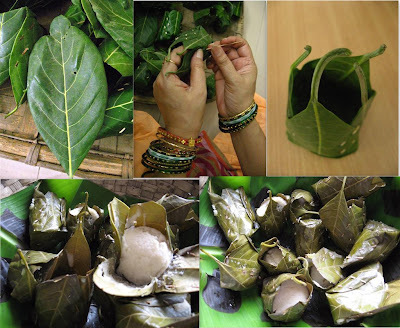 The colours traditionally were derived from natural dyes - from barks of trees, leaves, indigo, etc. However, today, synthetic dyes are used in a range of bright colours. The materials used for Rangoli take on either a flat appearance, when a uniform monolayer of powders are sprinkled or a 3-D effect when different sized grains like cereals, pulses etc are used either in their natural colouring or tinted with natural dyes are used. ABC Wednesday - L for Love! 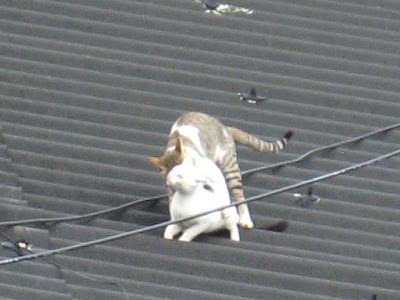 Lovers on a hot tin roof! 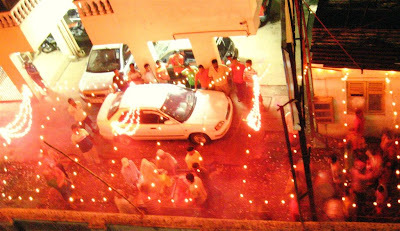 In India, red powder called Gulal is flung into the air during prcessions to mark celebrations. Red is the color of festivity, vibrancy, energy and love. 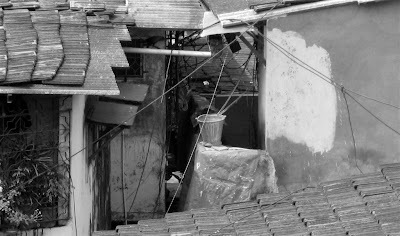 A bucket on the roof?! Hmm... used to carry paint for an exterior paint job! Otherwise also used for rain harvesting?! Camera critters - Face off! 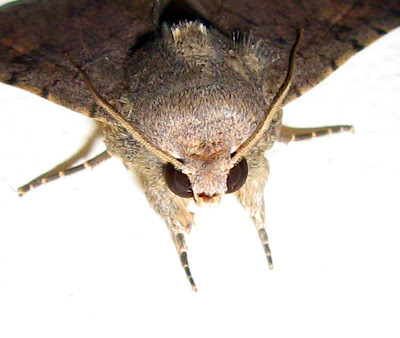 Face off with a moth who is wearing aviators! 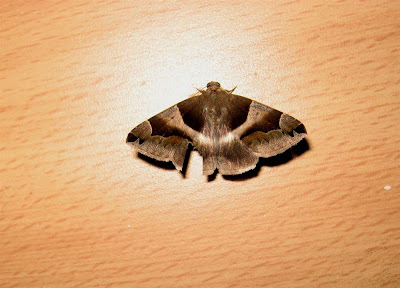 This is another moth that is found in Mumbai! 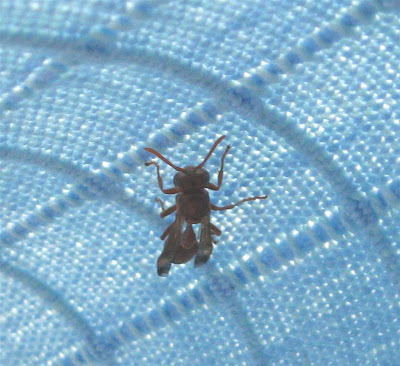 Poor chap is injured! 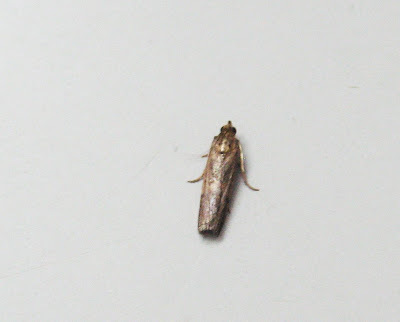 This guy is sure tiny. Caught him strolling around near the window! The taste and aroma is unique and wonderful! They are prepared only on special occasions. They are the original form of idlis which are steamed in steel containers.